It appears Winter is finally approaching and with it the holidays and all that comes with them. We plan to be open through December 23rd, then possibly by special arrangement through the rest of the month. Depending on how busy we are in the coming weeks, we may offer a modified menu, especially as we approach Winter Break. As always, I encourage you to pre-order if there is something you are counting on. This is a huge help to us, and of course much more convenient and predictable for you. And follow/like us on Facebook, Instagram, and/or Twitter to see what’s cooking! I also want to share this recipe for the crackers I posted on Instagram yesterday. I bought something similar in San Francisco at Seed+Salt and they totally sustained me as we traveled. They are so yummy, sturdy enough to dip, and perfect with a salad or bowl of soup. 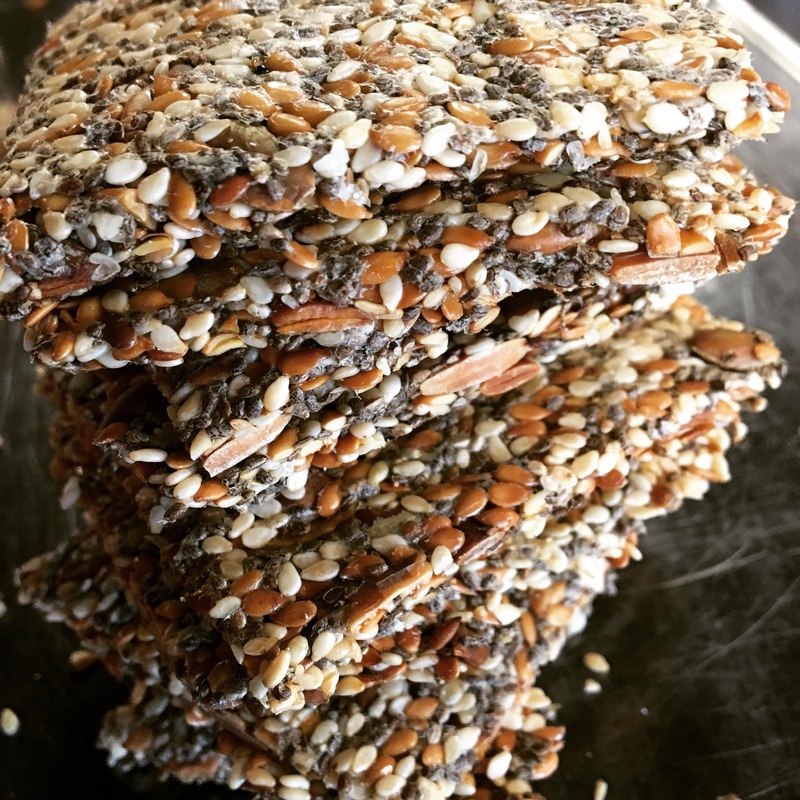 They are super simple to make – just gather up some sprouted seeds, mix them up with a little salt and water, then spread them out and bake until they are crispy. They have a delicious toasty taste and are so, so good with cashew cream cheese. I know many people feel really busy at this time of year, maybe a little stressed, and there is for sure a ton of not-so-healthy food available all the time. These will be so good to have on hand to stave off hunger and keep your body happy until a balanced meal can be had! additional flavors, optional: fresh or dried herbs, fennel or caraway, garlic, onion, chili peppers, etc. Preheat oven to 350 degrees and have a 10×15-inch tray at the ready (locals – you can buy this size stainless steel trays at McGuckins). Put all ingredients in a bowl and stir to combine. Set the mixture aside for about 10 minutes to allow the chia/flax to get a little gelatinous; this is your binder. Cut 2 pieces of parchment* the size of your tray. Place the seed mixture on one piece of parchment, then place the second on top and use a rolling pin or your hands to roll/pat out evenly. It will cover the whole tray/parchment. Put the rolled crackers in the oven on the tray, still between the two pieces of parchment and bake for about 30 minutes. Remove crackers from the oven and carefully flip them over, then remove the parchment that is on top. Use a knife or pizza cutter to cut into the shapes of your choice, sprinkle with salt and other seasonings as desired. Turn the oven down to 325 and put the cut crackers back in the oven, this time uncovered, and bake for another 15-30 minutes. At 15, the crackers on the perimeter of the tray will probably be done, so you can pull them out and place on a cooling rack and let the rest continue to cook until golden brown and crispy. Place on a rack to cool, then enjoy! Store whatever you don’t eat in a sealed container.